MANILA, Philippines - A Japanese business process outsourcing (BPO) and IT company is set to offer around 2,000 jobs for the Filipinos in the next four years of its operations. [L-R] Transcosmos Country Head Hanna Supetran, DOST Deputy Executive Director Monchito Ibrahim, PEZA Director General Lilia De Lima, Senator Bam Aquino, Transcosmos President and COO Masataka Okuda and Transcosmos Executive Vice President Koichi Iwami - performed Kagami Biraki, the Japanese opening ceremony tradition. 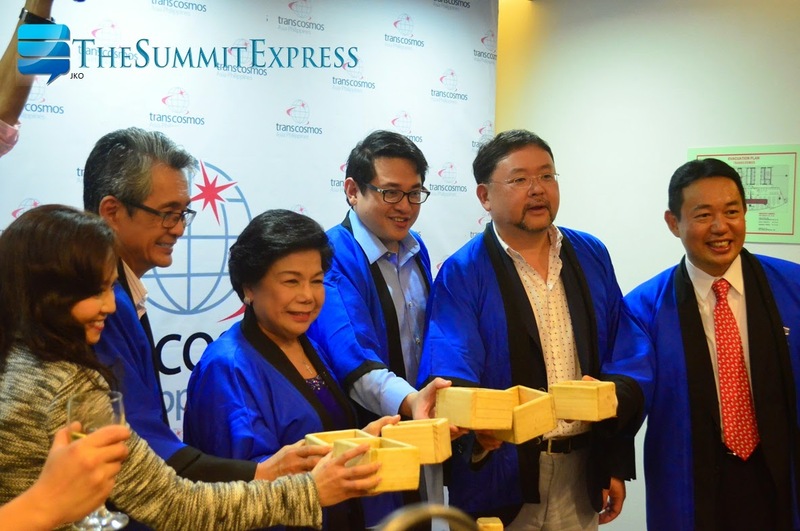 Transcosmos Asia Philippines Inc. (transcosmos) was inaugurated on Thursday, October 2, 2014 in a media conference held in its office location at One Corporate Center, Ortigas Complex in Pasig City. transcosmos with headquarter in Tokyo, Japan and currently the rank No. 1 in the World’s BPO Player for The Asia/Pacific and Japan region will begin full operations in the country in November this year offering customer services (voice) with initial of 144 employees. Country Head Hanna Supetran said that the firm's forecast until 2018 is to have at least 2,000 employees for the target wide array of services. In addition to providing BPO services such as contact center and back-office operations for the Philippines market, transcosmos Philippines will provide development and operation services for smartphone websites and applications. Furthermore, off-shore operations such as contact center services with English as the primary language will be offered for the global market. “The Philippines is a market that is attracting attention with a population size of about 100 million and an economic growth rate of around 7%. Our future aim is to also expand in areas such as E-Commerce one-stop services and analytics services, as we strive to develop services that help increase sales and reduce costs for our client companies," transcosmos Philippines President Hideki Yamashita has commented. Yamashita told TheSummitExpress that they are also looking for possible expansion in the country outside Metro Manila particulary in the top travel destinations - Cebu, Davao and Iloilo. Bam Aquino, the Chairman of the Senate Committee on Trade, Commerce, and Entrepreneurship graced the event and highlighted their commitment to support in providing jobs for the Filipinos. He even gave a challenge to transcosmos directors to grow at most 20,000 employees in the country. Lilia B. De Lima, Philippine Economic Zone Authority (PEZA) Director General emphasized that Japanese is one of the biggest investors in the country and said that Philippines is the best place to invest in Asia. With the establishment of transcosmos Philippines, global bases deployed by transcosmos will extend to 70 locations, and its penetration of the ASEAN region will move into its fourth country following Thailand, Indonesia and Vietnam. transcosmos Philippines is aiming for sales of ¥2 billion by fiscal 2018.